Not everyone was happy when The Dangerous Summer drifted away from their pop punk roots toward a rock sound. Some of it depends on what you love. Some people love most emo. Me too. It's also why I embraced this band's transition. The Dangerous Summer felt a calling to bring some of what they learned as a pop punk and emo band into rock, giving the mainstream a shot of urgency that many rock bands just don't have. So yeah, I was one of the people who embraced War Paint. 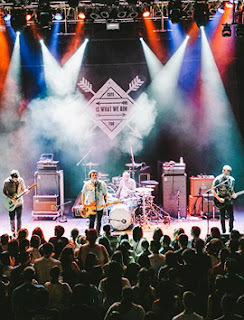 The Dangerous Summer simultaneously made room for a younger band in the alternative sub-genre while bringing a badly needed complexity to rock and roll. After listening to their newest release, I think they perfected the sound. Some people might still call it alternative. Whatever. It's great rock. Golden Record is a high point for The Dangerous Summer. Golden Record comes across as exactly what it is meant to be. If there has been an evolution of sound over the last seven years, this album arrives at the end of the transformation. This long and drawn out natural progression has culminated with some of their best material. The opener Catholic Girls is the perfect place to start. It sets the tone for the album and introduces exactly what you ought to expect. Frontman AJ Perdomo brings his signature emotive vocals to bear in urgent, atmospheric rock. It's appropriately pained and somber. There isn't any mistake in what the band accomplishes. Catholic Girls sets up its chills with the contemplative tragedy that is life. They hit fans right between the eyes, saying I've been there too. Sins is a poignant and pained song about long distance love. The Dangerous Summer hits on the uncertainty of it. It doesn't even matter if the separation is abroad or across town over summer break, the longing feels the same. Phone calls aren't enough. This is precisely the kind of material that has kept this band relevant for so long. Drowning tackles the angst of becoming jaded. Knives professes commitment but not without a price. Honesty brings up what happens when none of it works out. And the balance of the album largely exists in those feelings. If there is any emo left, it's likely attached to the band's ability to craft songs that are deeply introspective. They tell stories, but somehow pluck out stories that feel like our stories. And the only downside to that sometimes, if there is a downside, is that sometimes you want to listen to it alone. Along with a solid 10-track album, The Dangerous Summer has tacked on three revisit versions of their songs. Sins, Miles Apart, Catholic Girls all have alternative mixes that bring in pop elements, acoustics, or otherwise stripped-down versions of the songs. Lastly, they include the acoustic demo version of Sins, which doesn't sound much like a demo. The Dangerous Summer Golden Record Shines 8.1 On The Liquid Hip Richter Scale. This album picks up where War Paint left off with an outstanding sense of confidence from the band. There might not be as much diversity as their last outing, but some of that could be attributed to the addition of Matt Kennedy (guitar) and Ben Cato (drums), who came on last year to round out what has become a Perdomo and Cody Payne production. The Dangerous Summer is touring the United States through September. At the end of it, they are taking a short tour within the United Kingdom. Golden Record (Deluxe Version) from The Dangerous Summer can be picked up at Amazon. You can also also order the vinyl edition from Barnes & Noble or download it from iTunes. For touring details, find them on Facebook.